Review posted January 3, 2018. Wipf & Stock, Eugene, Oregon, 2015. 345 pages. This is a book from the nineteenth century that has been annotated and edited for today. It’s still in an old-fashioned style with very dense reading. But my goodness! Thomas Allin lays out the case for Universalism unapologetically. Some authors confess to doubts. Not this one! He is completely convinced of the Larger Hope – and his conviction and enthusiasm is contagious and joyous. The truth is, it’s wonderful to be able to believe that God’s love will indeed triumph and ALL the world will be saved – just like the Bible says! Reason – this makes sense with everything we know of God. In this section, he points out the logical fallacies in the teaching of a hell of unending torment after death. He goes into great detail and tackles many possible arguments. There are many reasons not to believe this, even if, no, especially if you believe Scripture. Mind you, he’s not saying there is no hell – only that it will not last for all eternity. If you look at the Greek, that’s not what the Bible teaches. But in using reason, he points out such things as the fact that if all sin gets the same punishment – unending torment – then the punishment doesn’t fit the crime. If punishment is designed to restore the sinner – it will be different amounts depending on the sin that needs to be overcome. Which makes a lot more sense, once you think about it. Pursuing our remarks, I must also remind you of another feature of the popular belief that seems to present a great difficulty; it is what I must call its paltriness, its unworthiness of God. Let us for the moment not think of God as a good, loving, and righteous Being. Let us now simply regard him as great, as irresistible, as almighty. Viewed thus, how difficult is it to accept that account which the ordinary creed gives us of this Being’s attempt at the rescue of his fallen creature, man. An almighty Being puts forth every effort to gain a certain end; sends inspired men to teach others; works miracles, signs, wonders in heaven and on earth, all for this end of man’s safety; nay, at the last, sends forth his own Son – very God – himself almighty. The almighty Son stoops not alone to take our nature on him, but lower still – far lower – stoops to degradation; meekly accepts insults and scourging, bends to the bitter cross even, and all this to gain a certain end. And yet, we are told, this end is not gained after all, man is not saved, for countless myriads are in fact left to hopeless, endless misery; and that, though for every one of these lost ones, so to speak, has been shed the lifeblood of God’s own Son. Now, if I may be permitted to speak freely, it is wholly inconceivable that the definite plan of an almighty Being should end in failure – that this should be the result of the agony of the Eternal Son. God has, in the face of angels and of men, before the universe and its gaze of wonder, entered himself into the arena, become himself a combatant, has wrestled with the foe, and has been defeated. I can bring myself to imagine those who reject the deity of Christ as believing in his defeat; but it is passing strange that those who believe him to be “very God Almighty,” are loudest in asserting his failure. The second section is called “Universalism Asserted on the Authority of Tradition” – the majority of the church fathers believed in universalism, that at the end of the ages all will be saved and all will be restored. This section is even denser, and even harder to read – because Thomas Allin pulls out quotations from hundreds of ancient writings. If I thought nineteenth century prose was difficult to read – these are even harder. However, that said, all the quotations make his case so decisively, it feels like overkill. He goes chronologically through the centuries, beginning with the very earliest church fathers and proves with quotations that many, many of the most respected pillars of the church clearly taught that God will save everyone at the end of the ages. An important point I had heard before is that the Greek word aionian -- which is translated as “eternal” in English didn’t really mean that at all in Greek. “Of the ages” or “age-long” is a better translation, though it’s not simple to translate – because we don’t really even have a word for it in English. But Thomas Allin makes the point that as long as the church fathers were native Greek speakers, the majority teaching of the church was that all mankind would (eventually) be saved, and that hell is restorative, not punitive. If, he says, we see one falling into sin we indeed are sorry, and hasten to rescue him, but we cannot be saddened, knowing that “with God no rational creature perishes eternally” (Commentary on Galatians 5:22). “Death shall come as a visitor to the impious; it will not be perpetual; it will not annihilate them; but will prolong its visit, till the impiety which is in them shall be consumed” (Commentary on Micah 5:8). There is another point, whose importance – in view of some modern teaching – seems to me very great: it is the teaching of so many, and such illustrious Fathers, that death is no penalty, but is, indeed, a cure; that it is, in fact, the great Potter remolding his own handiwork to restore it to its pristine beauty, and that the sinner’s destruction means but the destruction of the sin – the sinner perishes, the man lives. Such teaching would be significant even in a solitary instance; but here we have witness upon witness, to whom Greek was a familiar and a living tongue, repeating the same striking idea; teaching death to be no penalty, but the remolding of our nature by the Heavenly Artist, and designed to cure sin; teaching, too, that the sinner’s destruction by God is not loss but gain, is not annihilation, but conversion and reformation. The third section is called “Universalism Asserted on the Authority of Scripture.” Here the author gets especially animated and joyful – pointing out an abundance of passages that, taken at face value, strongly support the larger hope. But those who support the popular view discount them or read into them things that aren’t there – without even realizing that’s what they’re doing. “But I say, ’love your enemies.’” Will the advocates of endless penalty frankly tell us how that can be reconciled with the letter, or the spirit, of this text? Will they explain why God commands us to love our enemies, when he consigns his own enemies to an endless hell; and why he bids us to do good to those who hate us, when he means for ever to punish and do evil to those who hate him? Is God in earnest in telling us that he reconciles the world? Does he mean what he says, or does he only mean that he will try to reconcile it, but will be baffled? This question often rises unbidden, as we read these statements of the Bible, and compare them with the popular creed, which turns “all” into “some,” when salvation is promised to “all,” and turns the “world,” when that is said to be saved, into a larger or smaller fraction of men. There’s a whole lot more where that came from. 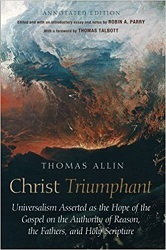 I’ve been considering this for years, but Thomas Allin finds yet more verses I hadn’t thought of yet as teaching universalism – even though I already had noticed many. The final section is the conclusion and summary of all the arguments that went before and firmly asserts that we can confidently believe in universalism – and a triumphant Christ. With all earnestness, I repeat that our choice lies between accepting the victory of Christ or of evil, and between these alternatives only. Escape from this dilemma there is none. It avails nothing to diminish, as many now teach, the number of the lost; or to assert that they will be finally annihilated. All such modifications leave quite untouched the central difficulty of the popular creed – the triumph of evil. Sin for ever present with its taint, even in a single instance, is sin triumphant. Sin that God has been unable to remove (and has had no resource but to annihilate the sinner) is sin triumphant and death victorious. Here’s the final paragraph, which makes my heart sing. Truly, God is loving, and God is good – to all humanity. I marked many, many passages in this book to post in Sonderquotes – but it’s going to be awhile before I get them all posted. However, you’ll find some, even from the day I’m posting this review. This book isn’t easy reading. I read a little bit per day over a very long period of time. But its message is so joyful and uplifting. If you would like to believe in universalism but think the Bible or even the historic church teaches differently – I highly, highly recommend delving through this book.